Stop the presses! Finally, a truly unique version of the run-of-the-mill slot machine hits the casinos. 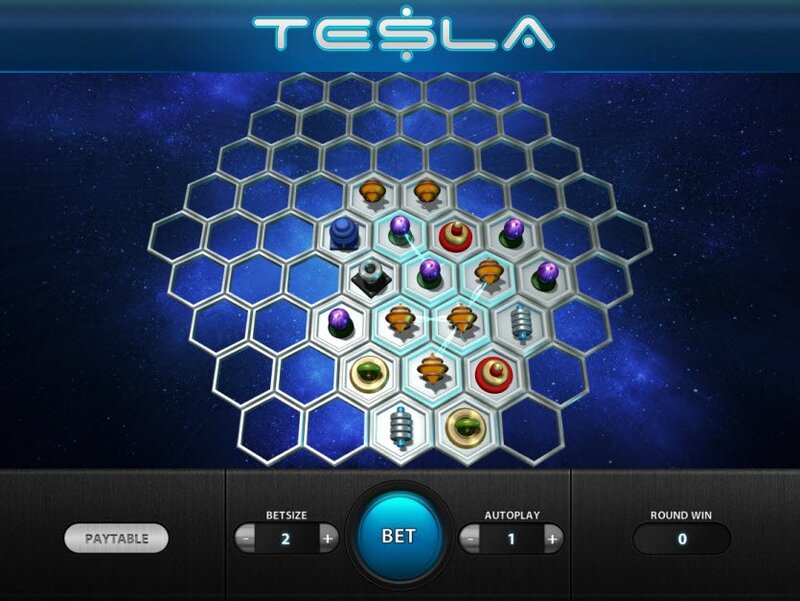 Powered by Relax Gaming, the Tesla slot machine has a hexagonal game board. The objective of the game is to reveal connected groups of identical symbols. There are 7 normal symbols in the game. Payouts vary between symbols, and the larger the group, the larger the payout. There are also Multiplying Wilds that copy themselves into up to 3 additional cells to boost winnings. You’ll be shocked to see Tesla’s high-quality, 3D graphics. I love the realistic looking electric current that runs through matching symbols. Meanwhile, the hexagonal game board appears to float through outer space. The soundtrack is pretty catchy, especially for an online casino game! Enjoy the ethereal, trance-like music playing in the background. The Tesla video slot has a completely different set of rules and paylines. The game starts with the middle cell of the board revealed and electrified. Any identical symbols touching an electrified symbol also become electrified. 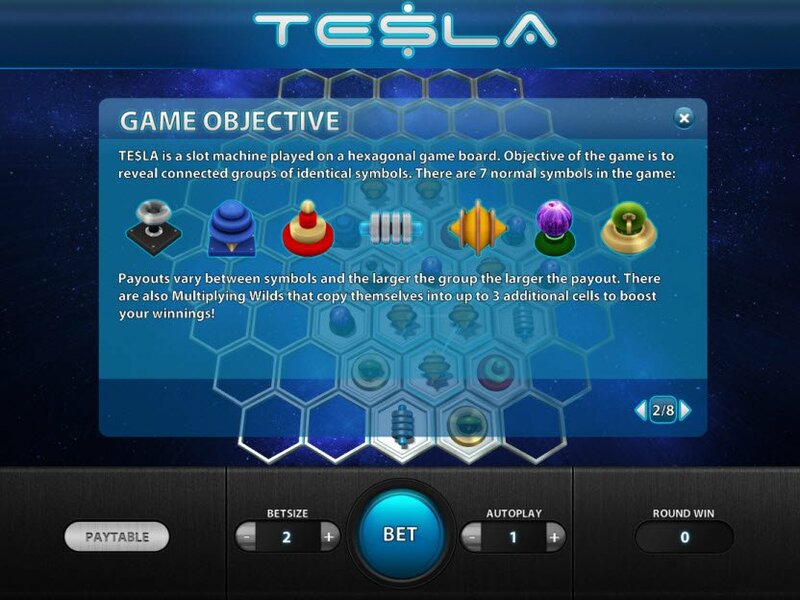 The Tesla video slot has a completely different set of rules and paylines. The game starts with the middle cell of the board revealed and electrified. Any identical symbols touching an electrified symbol also electrify. Then any symbols in cells adjacent to electrified cells flip over. If there are visible, continuous groups of at least 3 identical symbols, they electrify as well. 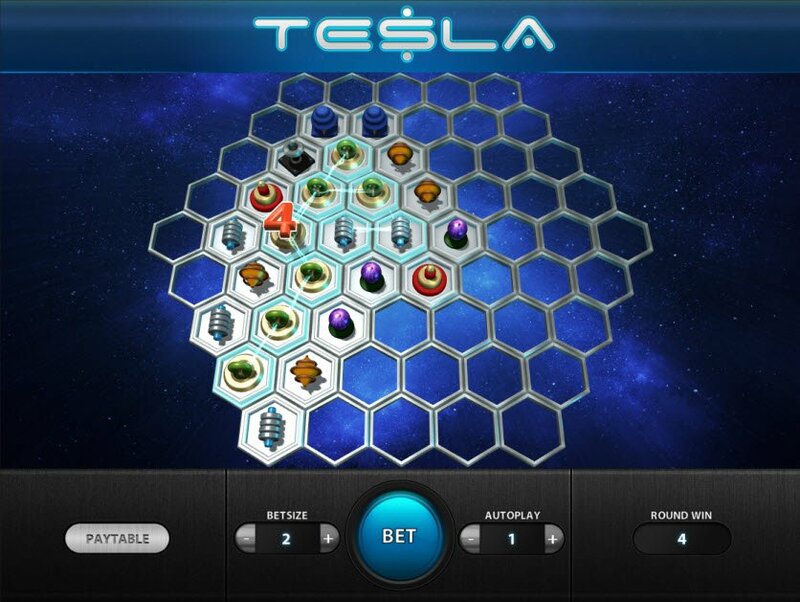 In addition, the Tesla slot machine bonuses have Multiplying Wilds. When a wild symbol appears, it copies itself into up to three adjacent cells, after which all wilds become copies of symbols in a group that found them.